CHARLOTTESVILLE, Va. -- A man seen in newly-released surveillance video who was apparently following a missing University of Virginia student the night she vanished told police he was trying to help the teen, reports CBS affiliate WTVR. He reportedly told police he saw another man come up to 18-year-old Hannah Graham and put his arm around her, and police are now hoping to talk to the other male. Graham vanished early Saturday after eating dinner with friends and attending two house parties, leaving the second one alone. Her disappearance has sparked widespread searches and deep concern from friends, family and the university community. She was last heard from at 1:20 a.m. that morning when she texted a friend to say she was lost after leaving the party. In recent days, a series of surveillance videos have emerged as police have canvassed Charlottesville businesses, asking for any security footage that may have captured images of the teen. Investigators have used the videos to re-trace Graham's steps in the time period before she sent the text. The second-year student was seen walking near a downtown pub, running past a gas station, and in the most recent videos, walking on Charlottesville's downtown pedestrian mall with a man apparently following her. That man has come forward to police, saying the teen seemed physically distressed and he "wanted to make sure she got safely wherever she was going," reports the station. He also reportedly called in to a tipline with the information. The man first appears on a video from a pizza shop along the pedestrian mall at 1:06 a.m. Saturday. It shows him walking into the camera's view, looking over his shoulder, and stepping into a doorway as Graham walks past him. After she passes, the man starts walking behind her. The second video is from a camera inside a jewelry shop, also on the pedestrian mall, showing Graham walking with the same man some distance behind her at 1:08 a.m., reports the station. The man told police he saw another man approach Graham and put his arm around her, reports the station. He said Graham didn't react and seemed to know him. The two started talking, and the man said it appeared he was "was either known to Ms. Graham or was trying to help her." He said he went on his way, and the two were still talking as he left, reports the station. Thursday morning, the search for the teen had expanded east to the banks of the Rivanna River, reported CBS affiliate WCAV. Wednesday, police urged anyone with more information about the teen's disappearance to come forward, and her parents issued a statement through police stating they feared the worst. "Hannah is beyond precious to us. We are truly devastated by her disappearance," read the statement issued by her parents, John and Susan Graham. "It's totally out of character for us not to have heard from her and we fear foul play." Police have said they have no evidence to point to any criminal elements in her disappearance. The search for the northern Virginia woman has involved local police, the Virginia State Police, University of Virginia police and the FBI, which is processing leads. The search has also included canine teams and helicopters. Police describe Graham as a white female, about five feet, 11 inches tall, with blue eyes, light brown hair and freckles. 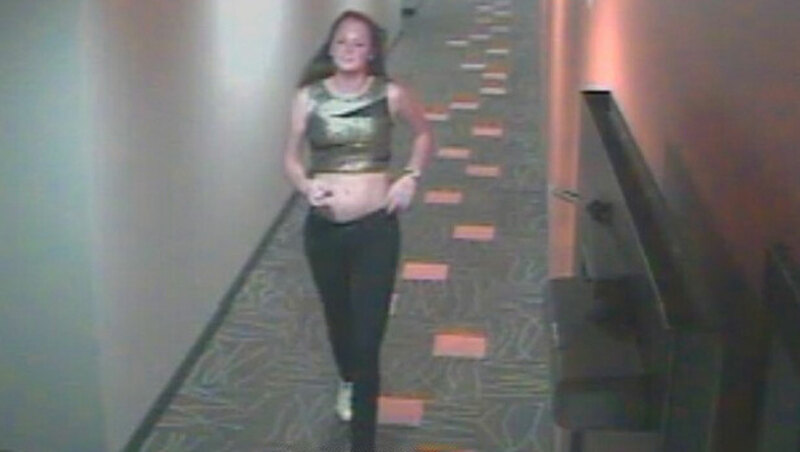 She was last seen wearing a black crop top with mesh cutouts. Anyone with information about her whereabouts is asked to call 434-295-3851.